Jen Schultz and Dana Krivogorsky. 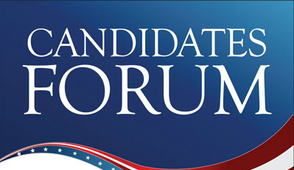 LWV Duluth has updated the “open chair” policy to ensure that every candidate has an opportunity to participate in candidate forums. In order to respect the time and interests of voters and candidates who attend, even if only one of the candidates in a contested race is in attendance, each candidate present will be allowed to present her/his views to voters. This new policy was adopted by the LWV Duluth Board in September, 2014.